Fuji has unleashed four new bridge cameras, with the SL1000 boasting an impressive 50x optical zoom lens. The Fuji SL1000 also includes a 1cm super macro for shooting close up subjects, while the 35mm equivalent of that massive focal length is 1200mm. Intelligent Digital Zoom is also include to effectively double the zoom range to 2400mm, or 100x. Not only that, but the lens boasts a pretty fast maximum aperture, at f/2.9 at the wide angle. That makes it second only to the Panasonic FZ200, which has an f/2.8 constant aperture throughout its range. By contrast, the Fuji rises up to f/6.5 at the telephoto end of the zoom range. The Fuji SL1000 also includes a 16 million pixel 1/2.3-inch BSI-CMOS sensor, which boasts the capability of shooting up to sensitivities as high as ISO 12,800. Autofocus speeds are claimed to be as fast as 0.2 seconds, while the camera has an apparent start up time of 0.9 seconds and a continuous shooting mode of 10fps at full resolution. Full HD video recording at 60p and stereo sound is also included. A number of video editing features, including Movie Trimming, are also available. On the back of the camera is a 920k dot electronic viewfinder, along with a 920k dot, 3-inch tilting LCD screen. An eye sensor has the ability to detect when the camera is lifted to the eye for quickly switching between the screen and the EVF. As well as a standard zoom lever around the shutter button, a second lever is placed at the side of the lens barrel, enabling you to adjust the zoom with your left hand. A mode dial is included for switching between manual, automatic and semi-automatic modes. Raw image capture is also available. Next up are the Fuji FinePix S8200 and Fuji FinePix S8500 bridge cameras, which both incorporate fast maximum apertures of f/2.9. The S8200 has a 40x optical zoom lens, while the S8500 has a 46x optical zoom lens. Both cameras house a 16 million pixel 1/2.3-inch BSI-CMOS sensor, and are capable of shooting up to ISO 12800. Autofocus speeds are claimed at 0.3 seconds, with start up times of one second, and a 0.5-second interval between shots. 10fps shooting (max 10 frames at full resolution) is also available. The camera is capable of shooting at 60fps at lower resolutions. Full HD video recording is available, while creative modes such as digital filters are also included. On the back of the cameras is a 460k dot LCD screen, along with a 200k dot electronic viewfinder. Manual and semi-automatic modes are available, but raw shooting is not. 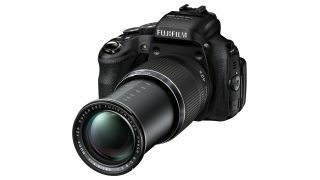 Finally, the Fuji FinePix HS50 EXR boasts a 42x optical zoom lens with a manual zoom mechanism for precision while zooming. Fuji also claims that the camera has the world's fastest autofocus, at 0.04 seconds, thanks to the new Phase Detection pixels on its 1/2-inch 16 million pixel EXR CMOS II sensor. The Intelligent Hybrid AF system can choose between Phase Detection AF or switch to Contrast AF in low light, to select the best focusing system. Focus Peaking is available to help with manual focusing, by highlighting areas in the composition that are in focus. Along with quick autofocus time, start up time is just 0.5 seconds, while the interval between shots is 0.5 seconds. 11fps shooting at full resolution is also available for up to five frames. On the back of the camera is a 920k dot electronic viewfinder, along with a 3-inch vari-angle 920k dot LCD screen. Other premium elements of this bridge camera include fully manual, semi-automatic and fully automatic modes, raw shooting, film simulation and a virtual horizon (electronic level) display. Pricing and availability for the new Fuji bridge cameras has yet to be announced.